Prayer is an action that, outside of church, is intensely personal. As parents, it can be hard to teach children about prayer. Yes, we can teach them verbal prayers such as the Our Father and the Rosary. However, a solid relationship with God goes beyond verbal, memorized prayers to a mental conversation with God the Father. 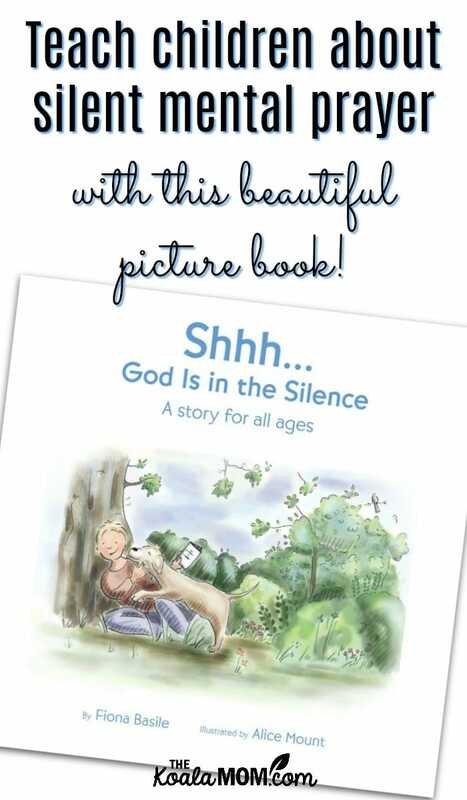 This is what’s hard to express to children, but is beautifully captured by author Fiona Basile in Shhh… God Is in the Silence. I received this book for review courtesy of the publisher; all opinions expressed are my own. This post contains affiliate links. Shhh… God Is in the Silence encourages children to take a moment, quiet their minds, and look around for signs of God in the every day. With repetitive, soothing words written by Fiona Basile and warm illustrations by Alice Mount, children are invited into a space of quiet to meditate and connect with the Divine. Through the gentle repetition of simple yet profound truths, Shhh… God Is in the Silence promises to help children and their families realize that silence is itself a form of prayer—the part of the prayer conversation when we quiet our minds to listen to God in our hearts. Many of us spend our prayer time talking—saying novenas or Hail Marys or presenting our requests to God—and don’t pause to listen. This simple yet beautiful book encourages us to wait for God’s whisper to us. anyone looking for a meditative reminder of silence as prayer. TKM: Why did you write Shhh… God Is in the Silence? Fiona: I wrote this book because of an inspiration from the Holy Spirit. I was on a 30-day silent retreat at a Jesuit community and I was contemplating how I could serve as a sign of God’s love in the world. In the middle of the night the Holy Spirit inspired me with the idea for Shhh…God Is in the Silence. TKM: What do you want children to learn from Shhh… God Is in the Silence? Fiona: I think we underestimate children and their ability to have a relationship with God. Something happens from the moment I first say, “Shhh… God is in the silence.” It’s so melodic and because of the way it builds using repetition, it doesn’t take long for them to join in. Because of this I hope the basic concepts of God’s love for them are reinforced. TKM: What are some ways you take a moment to meditate and connect with God? Fiona: I started with an eight-day spiritual retreat and then went on the 30-day retreat that inspired the book. It’s not completely silent. It’s more about an attitude of silence. I loved going for walks, reading, and swimming at the beach. The beach is such a beautiful place to contemplate God and find Him in nature. TKM: How will Shhh… God Is in the Silence help children look at their faith differently? Fiona: Children can grow up learning that God loves them but the book helps reinforce that concept in a soothing way that stays in a child’s mind. Even though it’s a children’s book, I think that the book can help even adults look at their faith differently. For me, I used the words of the book as my own personal mantra when I need a spiritual lift.